You asked for a Flat Visor cap and we listened. Introducing our newest baseball cap, 2XL Dark Navy Premium Flat Bill FlexFit®. 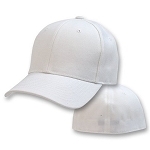 This Structured cap has the Pro Baseball On Field Shape.